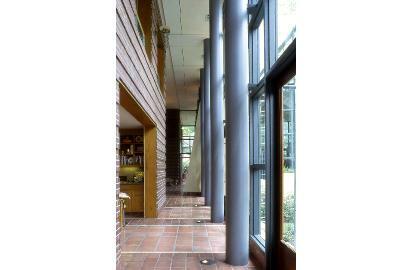 The design of this 8,000 square foot house in River Oaks, Houston, establishes a zone of cleavage between the narrow public front of the site and the expansive dimensions in the rear. Marked by a colonnade, this line is the distinction between public and private domains. Public program functions are expressed as separate pavilions and are compositionally arranged in a variety of ways to maximize views as well as enhance interior and exterior relationships. A contrasting palette of brick and stucco is used to reinforce the spatial composition.